I'm having trouble getting past lemons this season!! With another bucket of Dad's lemons on our doorstep I'm still searching for uses for the tart zests and juices. 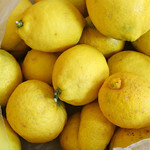 While we have had Lemon Chicken, Lemon Muffins, Lemon Bread, Hummus with Lemon and Lemon Limoncello Cheesecake with our own homemade Limoncello we are still on the search for new and exciting lemon recipes to try (Feel free to link to some below if you have a suggestion!). When Becky, of Baking and Cooking, a Tale of Two Loves, approached us about her online Bake Sale to benefit the American Cancer Society on May 2nd, lemon was obviously our first thought. 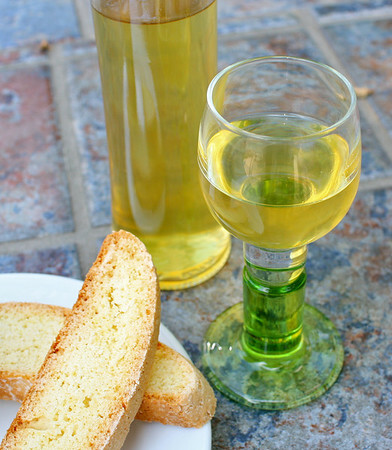 Putting some of our homemade Limoncello along with a bag of Lemon Limoncello Biscotti together I think we have a winner! The highest bidder will receive a Limoncello Bottle with 200 ml of Limoncello made from lemons from my dad's tree along with a bag of our favorite Lemon Limoncello Biscotti, we'll also throw in a few of our favorite lemon/limoncello recipes! Info on Becky's Bake Sale can be found on her site with bidding starting on May 2nd. Becky is a 15 year melanoma survivor and is participating as Team Captain for The American Cancer Society's Relay for Life in her county. She is making a difference and you can too! Using our own Limoncello, the Lemon Limoncello Biscotti receives a second dose of lemon from a helping of zest bringing even more of a lemon flavor to the table. Somewhat delicate in taste, these cookies are ideal with an evening tea or prefect with your morning coffee. I can also personally attest that they just may curb any afternoon snack craving you may be experiencing. Bid on our package on May 2nd and we'll be happy to get a box in the mail to you quickly! If Lemon is not your thing, be sure to visit Becky's site and check out the other bakers that she has on board. I'm sure you will find some of your favorite bloggers in the midst with offerings that will help make a difference. Lightly spoon flour into dry measuring cups; level with a knife. Combine flour, sugar, and baking powder in a large bowl. Combine rind, limoncello, and eggs, and add to flour mixture, stirring until well-blended (dough will be dry and crumbly). Turn dough out onto a lightly floured surface; knead lightly 7 to 8 times. Divide dough in half. Shape each portion into an 8-inch-long roll. Place rolls 6 inches apart on a baking sheet coated with cooking spray; flatten each roll to 1-inch thickness. Bake at 350° for 30 minutes. Remove the rolls from baking sheet; cool for 10 minutes on a wire rack. Cut each roll diagonally into 15 (1/2-inch) slices. Place the slices, cut sides down, on baking sheet. Reduce oven temperature to 325°; bake for 10 minutes. Turn cookies over; bake an additional 10 minutes (the cookies will be slightly soft in center but will harden as they cool). Remove from baking sheet, and cool completely on wire rack. Note: After slicing the biscotti, I place the cut cookies "standing up" rather than on one side or the other and bake for 16-18 minutes - alleviates turning! Thank you so much the shout out and post about the Online Bake Sale. It means a lot to me and all of the people fighting cancer for your donation. Your pics are gorgeous! I'll rack my brain for some more recipes to use up those luscious lemons from your Dad's tree. Yum...I know these two items are going to be part of a bidding war next week! I'm making lemon-white chooclate cookies. Going to test the recipe later this week. So excited about the bake sale! With some winning lemon wow recipes like these, I'm sure your stuff will be a hot item. Thanks so much for sharing the biscotti recipe! 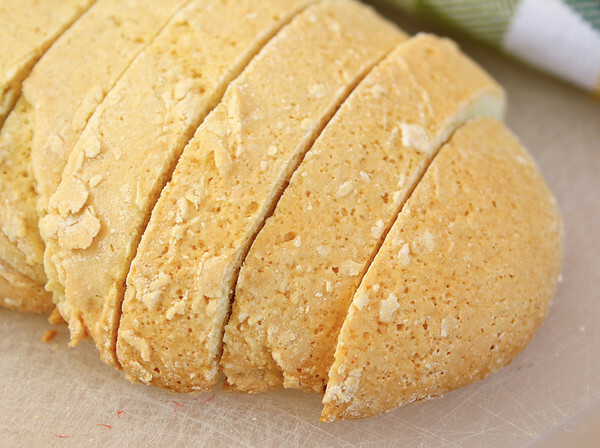 These lemon biscotti look delicious! Good luck with the bids! Thanks for supporting the American Cancer Society! I lost my dear wonderful mother to cancer this year. I'd love to see a cure around the corner! 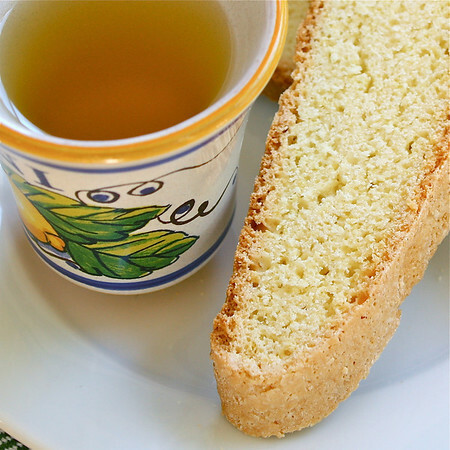 I adore biscotti and your recipe looks delicious especially with the homemade Limoncello. Great food for a great cause. Lovely to meet your blog! Happy cooking, Nicole. These in lemon sound fabulous I love biscotti! Good luck with the bake sale!! Lovely Lemon biscotti. Bookmarked it. Good luck for the bid. can i use lemon juice instead of limoncello? Wow another lemon recipe! Me too, I'm not tired of lemon sweets yet. 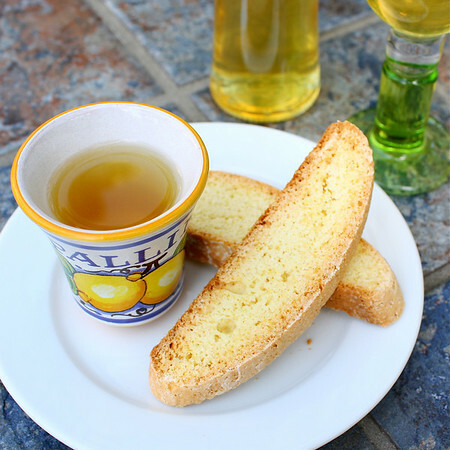 :-) Limoncello and lemon biscotti, what a great combination! I wish I have that for my snack... Best luck on your bid Kim! OH!!!!! I just look right side and saw my blog on your blog list! Lol! That made me a huge smile. THANK YOU! Ooo, having some homemade limoncello sounds pretty fantastic to me. :D And foo...if I'd known about this sooner, I would have participated too! Hope the bake sale goes well! I decided I wasn't up to entering the bake sale, but I'm definitely going to bid on your limoncello. A friend brought me a bottle from Italy and I've loved it ever since. I could feel myself salivating with the mere mention of lemon... haha. Good luck on your bake sale. I wish to participate in events such as this one too. I'm just curious how to do it. 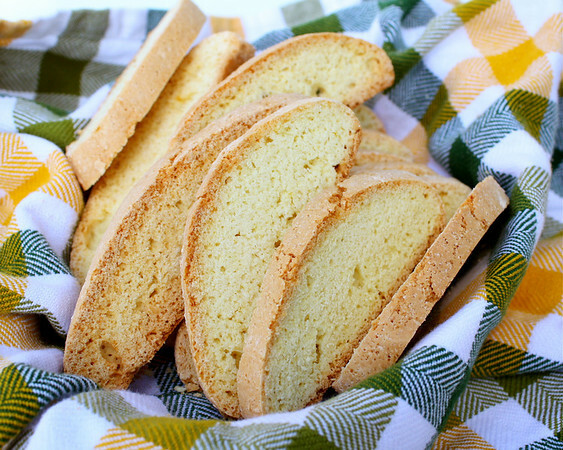 Your limoncello and these lemon biscotti seem like a perfect item for Becky's sale! Looking forward the 2nd of May! your biscotti looks crunchy...just the way i like them! I might have to bid on these. I'm hoping some of us can get photos accepted close to the sale date, hopefully it will drive more traffic and $$ Becky's way. Rusty is doing good, he says Thanks for asking. That biscotti is making my mouth water... can't wait to bid on this!! I just bought two huge bags of lemons yesterday. It must be lemon fever.